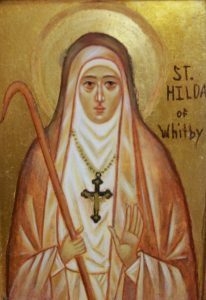 Hilda is former princess of Northumbria received her monastic training in France but in 657 returned to England to found a monastery. Later known as Whitby, this monastery housed both monks and nuns. In 663 a Synod of the English Church met there where it was agreed to accept the Roman liturgical usage over the indigenous Celtic rite. 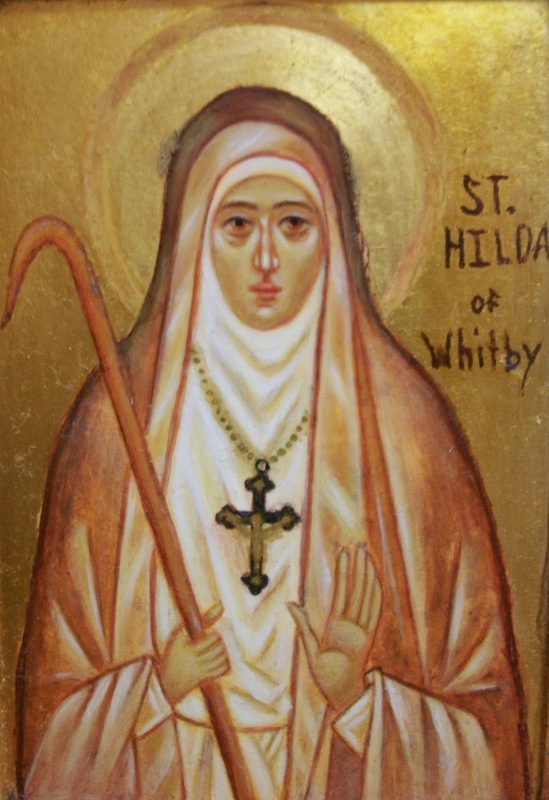 Abbess Hilda supported the Celtic party. After its destruction by the Danes in the 9th century, the monastery was refounded by Benedictines. It flourished until its suppression in the 16th century during the Protestant Reformation. So great was her prudence that not only ordinary folk, but kings and princes used to come and ask her advice in their difficulties and take it. Those under her direction were required to make a thorough study of the Scriptures and occupy themselves in good works, to such effect that many were found fitted for Holy Orders and the service of God’s altar.” Bede also says of Hilda, she urged her community “to preserve the gospel peace amongst themselves and towards all others,” then, “in the words of our Lord, she passed from death to life”. The place of her burial is unknown. “Mother Hilda was the advisor of rulers and ordinary folk as well; she insisted on the study of Holy Scripture and on the proper preparation for the priesthood; the influence of her example of peace and charity extended well beyond the walls of her monastery. The Catholic Church honors the memory of St Hilda today, while Orthodox Church liturgically recalls Hilda on July 14th.